Friends, this is a tough one to watch. And I don't necessarily recommend it for everyone, especially people who might be triggered by the events of the play. Proceed with caution, because Marsha Norman's Pulitzer Prize-winning play is 90 minutes of the most frank discussion of suicide I've ever seen. 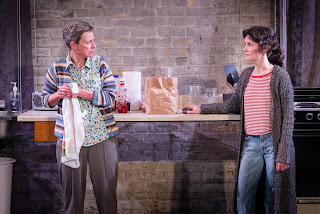 Dark and Stormy's production, featuring the two-person dream team of Artistic Director Sara Marsh and #TCTheater favorite Sally Wingert, is beautifully done and powerfully affecting, almost painfully so. And they're doing all the right things - partnering with the Minnesota chapter of the National Alliance on Mental Illness and including the National Suicide Prevention Lifeline (1-800-273-8255) - so that hopefully this play brings more awareness of and discussion about suicide. And it's also some really intense, intimate, engaging theater. I expect nothing less from Dark and Stormy. The play begins when Jessie tells her mother Thelma, who she lives with and takes care of in an Iowa farmhouse, that she's planning to kill herself that night. It's a shocking revelation, but Jessie doesn't play it that way, she's very matter-of-fact and pragmatic about the whole thing. She has everything planned out, and proceeds to tell her mother about all of the details of running the house, which she'll need to do by herself after tonight. Thelma moves through a variety of emotions, from thinking she's kidding, to trying to talk her out of it, to being angry about it, to acceptance. But Jessie never wavers, and the push and pull between them is heart-breaking to watch. Other characters (family members, friends) are mentioned but never seen, as the focus is on this very real relationship. I often say that two-person plays are my favorite, because it's just one long conversation that allows you to really get to know the characters and their relationship. 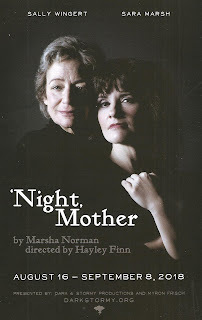 This is one such play, and both Sally and Sara give among the best performances I've seen from either of them. Maybe that's because in the Dark and Stormy's intimate warehouse art studio space, you're just a few feet away from the actors, close enough to see the tears in their eyes and hear the quiver in their voice. Sara has a calmness about her, as Jessie is sure of her decision and pleased to finally be at the place to carry out her plan, but you can see the pain she's been living with her whole life. Sally's is the more showy role, as Thelma goes through every emotion imaginable, and she nails every one with truth. This is not the first time these two have worked together, or played mother and daughter, and that shows in their intertwined performances that are a beautiful dialogue. Playwrights' Center Associate Artistic Director Hayley Finn directs her first Dark and Stormy show, and credit must be given to her for keeping the play grounded, real, and nicely paced. But what isn't grounded is the set. All set pieces, except for a comfy lived-in couch, are floating several inches off the ground, including a floating rocking chair, and a floating kitchen counter complete with sink and working stove and covered with Thelma's favorite foods (from many types of bulk candy to tuna and pickles). I'm not even going to begin to guess what that means but it adds some interesting food for thought. 'Night, Mother continues through September 8. Know what you're getting into, and be prepared for a difficult ride, as well as beautiful, heart-breaking, thought-provoking, conversation-starting theater.